ok, so we've been in this house for nearly four months now and it still looks like we JUST MOVED IN. at first it was fine, because honestly, there was too much travel to notice home, but now, i've been here long enough to know that i have to paint. oh and i need a desk, or a table really, a work table, for the paper goods that come off the press. i've got big plans for both and am sticking to gold and a pretty pale pink (i am so ready for pale pink walls). i'm hoping the work table comes together over the weekend ... maybe even before??? i'll let you know. 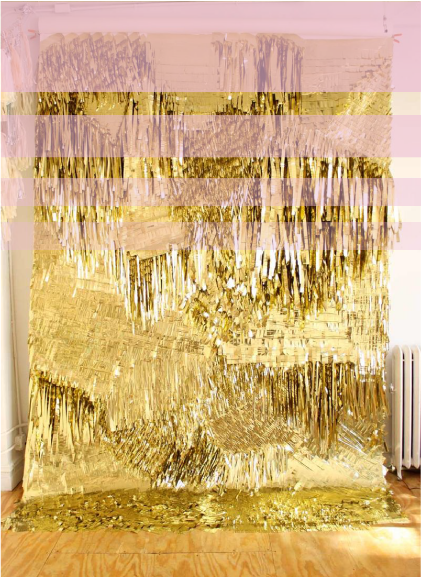 oh and if anyone (ahemm, you, confetti system) wants to come and create a gold fringe wall for me, well, i'd be down with that. i've lived in my house for a year and half and still have the same feelings--i'm still trying to make it a home!